RHRLI and ARTAS® offer a state-of-the-art hair restoration procedure that can change your life. It’s a minimally invasive hair procedure that uses robotic technology to harvest healthy donor hairs and transfers them to where they’re needed. The result is a healthy new head of hair. When you come to RHRLI for a consultation we’ll take you through every aspect of the ARTAS® procedure. Information is important, so here’s what we know about head massages and hair loss. 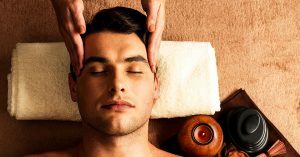 A 2016 study in the Journal Eplasty, examined the effects of scalp massage on Japanese men. Each of the nine men examined in the survey received 4 minutes of scalp massage for 24 weeks. Researchers used a mechanical device to conduct the scalp massage. Researchers cultured the test subjects’ dermal papilla cells to examine the result. The results showed that there was an increase in hair thickness after the 24 weeks compared to the thickness observed at the beginning of the study. Critics of the study point out that only nine people were involved in this survey and that more research is needed. Although, there are indications that it can be beneficial. Illinois based dermatologist, Jessie Cheung tells Readers Digest that if you undertake massage, it can be done while shampooing or if your hair is dry before shampooing, “You should aim for at least three minutes if you are working with both hands because that encompasses a large surface area,” Cheung says. There are several treatments that can be beneficial to patients with hair loss, but if you’re looking for a permanent solution that won’t involve scalpels and stitches, you can find it at RHRLI with ARTAS®. We can give you healthy hair in a virtually pain free procedure. Contact us today. Previous Post: « Which Autoimmune Diseases Cause Hair Loss?